A groundbreaking new experiment shows that brain-machine interfaces, when used in conjunction with exoskeletons and virtual reality, can trigger partial recovery in patients recovering from spinal cord injuries. “We couldn’t have predicted this surprising clinical outcome when we began the project,” noted Nicolelis in a press release. “What we’re showing in this paper is that patients who used a brain-machine interface for a long period of time experienced improvements in motor behavior, tactile sensations, and visceral functions below the level of the spinal cord injury.”In a new study published in Scientific Reports, eight patients paralyzed with spinal cord injuries exhibited partial restoration of muscle control and sensations in their lower limbs following an extensive training regimen with non-invasive brain-controlled robotics and a virtual reality system. Developed by Duke University neuroscience Miguel Nicolelis and colleagues, the system tapped into the patients’ own brain activity to simulate full control of their legs, causing the injured parts of their spinal cord to re-engage. Researchers have never seen this level of recovery in patients so long after being diagnosed with complete paralysis. Five of the participants in the study have been paralyzed for at least five years, while two have been paralyzed for more than a decade. Brain-machine interfaces (BMIs) work by establishing direct communication between the brain and a computer, which then allows patients to control external devices with their thoughts, including prosthetic limbs or exoskeletons. Earlier this year, Nicolelis showed that it was possible for a monkey to control a wheelchair with its mind, though with an implanted brain chip. In the new experiment, the system non-invasively recorded hundreds of brain patterns emitted by the brain, collecting these motor commands from those signals, and then translating them into movements. During the year long experiment, Nicolelis and his team investigated the ways in which BMI-based training could influence the ability of paraplegics to walk using a brain-controlled exoskeleton. To augment this process, they turned to virtual reality, which assisted with visualization and mind-body awareness. 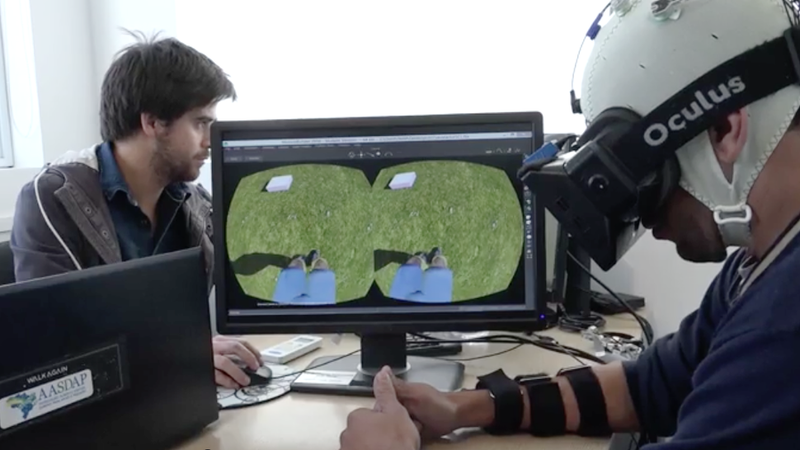 While in a virtual reality environment, and when hooked up to the exoskeletons, the patients could see virtual representations of the own bodies, and even receive tactile feedback. The results were extraordinary. The researchers observed dramatic improvements in the patients’ sensory capacities below the areas in which their spinal cord injuries occurred, including pain localization and find/crude touch. They also exhibited improved voluntary muscle control below the injury. Prior to this study, no one had shown that BMI-based training, in conjunction with physical activity, could induce this sort of neurological recovery. This study shows the potential for long-term training to trigger partial neurological recovery among paraplegics. The researchers aren’t entirely sure why the system works, but they suspect the weekly training re-engages the spinal cord nerves that survived injury. The brain-machine interface likely rekindled these nerves. Only a small portion of the fibers remained intact, but “enough to convey signals from the motor cortical area of the brain to the spinal cord,” noted Nicolelis. Many of the patients began to experience profound improvements after seven months of training. After 12 months, four patients experienced such improvements in sensation and muscle control that the doctors upgraded their diagnoses from complete to partial paralysis. In the most dramatic improvement, a 32-year-old woman who’s been paralyzed for 13 years, and who was unable to stand, was able to walk using a walker, braces, and a therapist’s help. During the 13th month of therapy, she was able to move her legs voluntarily while her body weight was supported in a harness. Looking ahead, the researchers plan to test their methods on patients who have been recently injured to determine the efficacy of quicker treatments.